Societal change can be one result of a war effort. 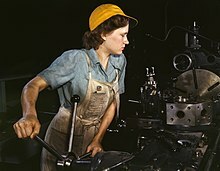 During World War II, women filled job positions that were traditionally male-dominated. See Rosie the Riveter. In politics and military planning, a war effort refers to a coordinated mobilization of society's resources—both industrial and human—towards the support of a military force. Depending on the militarization of the culture, the relative size of the armed forces and the society supporting them, the style of government, and the popular support for the military objectives, such war effort can range from a small industry to complete command of society. Although many societies were retroactively perceived to be engaged in a war effort, the concept was not generally used until the last decade of the 18th century, when the leaders of the French Revolution called for the levée en masse and a general mobilization of society to prevent monarchist forces from reclaiming control of the French government. The concept was subsequently adapted and used by Russia, the United Kingdom, and the United States, especially during World War I and World War II. The term war effort was coined in conjunction with these efforts. Although certain societies, especially nomadic raiders and mobile cavalry societies such as the Mongols, specialized in providing war-effort-like support for their armies, the idea of a specialized war effort that diverted supplies, means of production, and people to military support came into general use only with the increased specialization of the industrial revolution. Previously, most military supplies were either common elements of the economy (food, clothing, horses) or specialized instruments produced only for war purposes by industries dedicated to the task (mainly weapons and military vehicles). Moreover, in feudal societies, peasants—who were the great majority of the population—often perceived war as the business of the aristocrats, and did not feel especially obliged to make an extra effort to help their country's aristocracy win a war with that of another country. The modern concept of a state belonging to its "people" carried the naturally accompanying or associated assumption that war was everybody's business and everyone, combatant or not, was expected to contribute actively to winning it. Crossover use of peacetime elements of society and economy for wartime uses became important due to scarcity of manpower (due to the large size of armies) and specialized materials used for war production (rubber, aluminum, steel, etc.). 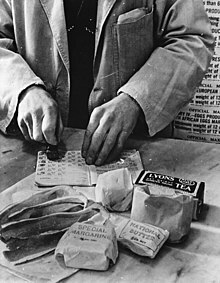 The complex decisions involved in conversion to wartime use also necessitated organization and a bureaucracy; the term war effort was coined to describe these collective tasks. Implicit in the concept of war effort was that the entire society was expected to contribute in some way; this served the double purpose of improving morale as well as resource conservation. Closely related is the concept of the Home Front—i.e., that civilians engaged in wartime pursuits (particularly, industrial production) are in effect also fighting the enemy on a "front" of their own, and that the result of their "fighting"—i.e., higher productivity, refraining from labor disputes, strikes, etc.—might determine the difference between victory and defeat. This page was last edited on 3 April 2019, at 08:57 (UTC).